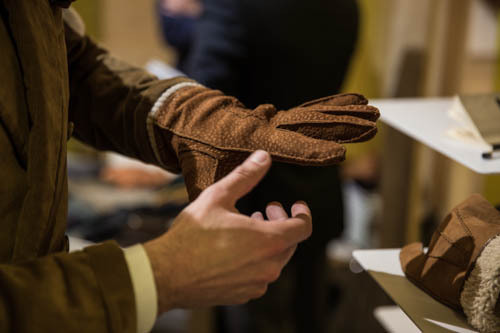 Rather like Maglia, which we discussed earlier in the week, Merola is among the very best makers in its field – in this case, gloves. 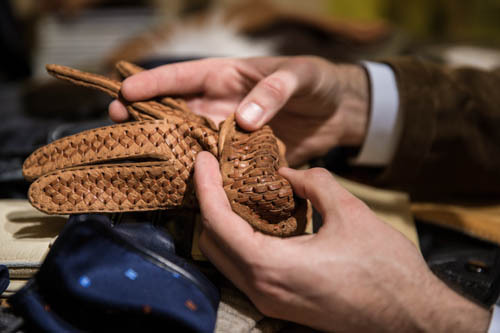 Both are also based in Rome and have a similarly stellar roster of private-label clients. 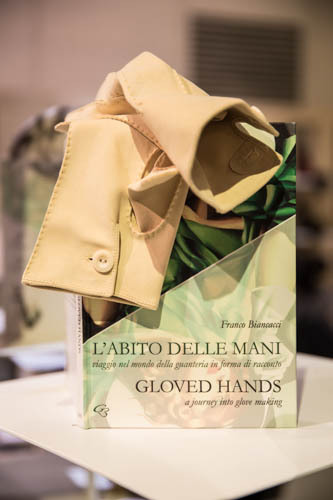 There is more competition in gloving, of course, with a decent number of hand makers around Europe and many hand-cutting but machine sewing, as most of Merola’s are. Dent’s and Chester Jefferies are the leaders in the UK. These makers tend to come with a long history, and the smart ones make the most of it. The Dent’s archive is certainly worth a look if you are ever in the area, but Merola goes one step further and often recreates old designs. 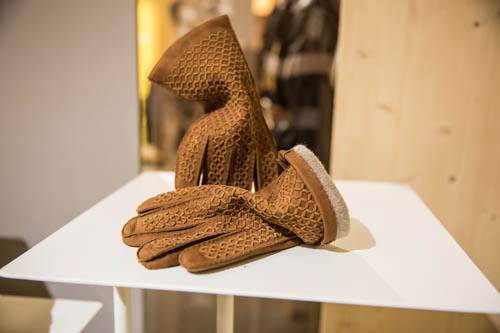 The best example on display at Pitti was a hand-sewn driving glove made beautifully in chamois leather (below). Most of the other designs being pushed at Pitti weren’t quite to my taste, such as gloves edged with a silk that would match your tie, or stitching in contrasting colours. It’s often the way at trade shows – the most eye-catching things are needed to grab attention but they’re not what people buy. Bresciani always has keyboards or Shakespeare stanzas on its socks. The peccary and capybara models – the king and queen of glove materials – were beautiful though, capybara (carpincho) best in a deep green and a thick, cashmere-lined version. Best of all was a chunky, knitted cashmere glove lined with more cashmere. It made your hands sweat just standing there. 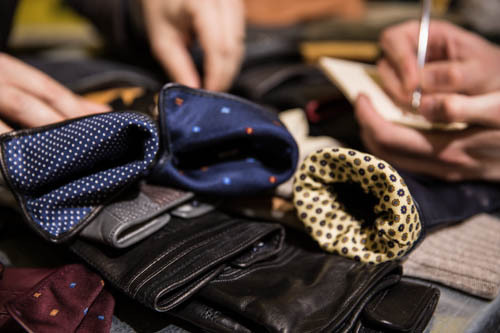 There is a list of stockists on the Merola website and A Suitable Wardrobe also carries a good range. 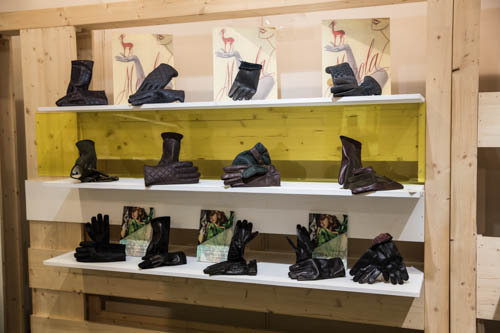 You can follow the discussion on Merola gloves by entering your email address in the box below. You will then receive an email every time a new comment is added. These will also contain a link to a page where you can stop the alerts, and remove all of your related data from the site. Are Chester Jeffrie’s bespoke gloves worth the money? The idea of merely tracing my hand and posting it to them does not seem like you would get a superior fit? Have you ever done this? If so could we see the quality of the tracing, rather than my attempts that look like a 5 yr olds scribbles? I’ve never tried it I’m afraid. I have done similar things at other makers (e.g. Paula Run for peccary) and it didn’t work well. Good to know, is it possible to have a fitting done with Chester Jefferies in person? After ordering a pair online I made a photo copy of my hands because I didn’t think my tracing angle would remain the same. Unfortunately, the glove fingers are very tight and the palm area is too loose. So, my extra effort didn’t help. If you decide to give the gloves a go I would recommend having CJ make a standard glove (7, 7 1/2, etc) but with finger length changes as needed. Good luck. I can certainly vouch for the quality of Merola gloves having purchased a pair a few years ago from the delightful, but unfortunately now closed, Foxs clothes store corner of London Wall/Moorgate. Lovely soft leather with red cashmere lining – just stunning. I have searched in vain for them everywhere and have just purchased a pair from Madova on line from Italy. Less than half the price of Merola and totally acceptable – though not quite the same. The one thing i liked about the Merola gloves particularly is that the pair i have do not have gussests (?) sewn between the top and bottom of the finger. I have small hands so gloves without this make one’s fingers appear slimmer and more elegant. I cannot understand why Merola do not offer an ‘on-line’ service. Your advise of them being stocked at Holland and Holland, a store i have never visited but will, is too late – shame on you!!!!! Thank you for the information and ‘my daily fix’ of Permanent Style. I hope this will be of help as having sold many pairs of CJ gloves through my entreprise in the past, I have always found the company to be extremely good and a look and quality not found in many other English makers.I also hope to introduce some of their product again in time. Keep up the great work PS. I am a certified and certifiable glove lover. Chester Jeffries made to measure service is CRAP. The materials are great but the fitting and workmanship are trash. Give me a RTW pair of Merola in my size, any day. Dents are also excellent. Check out Pickett too. There are wonderful French glovemakers too. 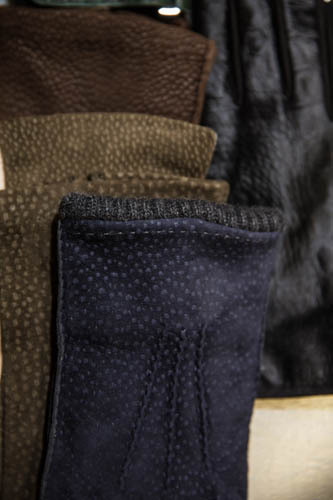 The Merola Peccary and Carpincho unlined… would you recommend them? I can only find the unlined variants, although would somewhat prefer some kind of lining, and I have the impression that unlined wouldn’t be overly comfortable.